Sacrilege is the first single from Yeah Yeah Yeahs' latest album, Mosquito. The video premiered 26 March 2013, but since I've been busy, I can only post it now >////<. The video stars British model and actress, Lily Cole (that's why I think the female star in this video is familiar). The story in this video goes backward with the opening scene of people burn something in the middle of a field. It turns out that they burn a woman and a man. The video then show how and why those people burn them. Lily Cole goes hot in this video. There are plenty of make-out scene between her and men, even with a woman too. If you fancy to look at it, you could download it here. 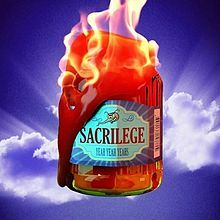 Even if this video doesn't suit your taste, I'm pretty sure you're going to love the music ("Sacrilege" was named "Best New Music" by Pitchfork Media). So, what do you think about their video?